Los Angeles' subway will become the first mass transit system in the U.S. to install body scanners that screen passengers for weapons and explosives, officials said recently. The machines scan for metallic and non-metallic objects on a person's body, can detect suspicious items from 30 feet (9 meters) away and have the capability of scanning more than 2,000 passengers per hour. "We're dealing with persistent threats to our transportation systems in our country," said Transportation Security Administration Administrator David Pekoske. "Our job is to ensure security in the transportation systems so that a terrorist incident does not happen on our watch." Recently, Pekoske and other officials demonstrated the new machines, which are being purchased from Thruvision, which is headquartered in the United Kingdom. "We're looking specifically for weapons that have the ability to cause a mass-casualty event," Wiggins said. "We're looking for explosive vests, we're looking for assault rifles. We're not necessarily looking for smaller weapons that don't have the ability to inflict mass casualties." In addition to the Thruvision scanners, the agency is also planning to purchase other body scanners — which resemble white television cameras on tripods — that have the ability to move around and hone in on specific people and angles, Wiggins said. "We really want to be effective and we need the ability to have a fixed field of view, but we also need to be able to move that field of view as necessary," Wiggins said. "Deploying these technologies together gives us that accuracy and minimizes any delays." Wiggins would not say how many of the machines were being purchased, but said they would be rolled out in subway stations in the "coming months." Employees and police officers first have to be trained on how to use the equipment. Signs will be posted at stations warning passengers they are subject to body scanner screening. The screening process is voluntary, Wiggins said, but customers who choose not be screened won't be able to ride on the subway. Some passengers saw the screening as an added layer of security. "I guess it is a good, precautionary thing," Andrea Kirsh said, a 22-year-old student from Corvallis, Oregon, who was traveling through Los Angeles' Union Station on Tuesday. "It makes me feel safe. As a civilian, I think we often don't know what to look for or what we would be looking for." 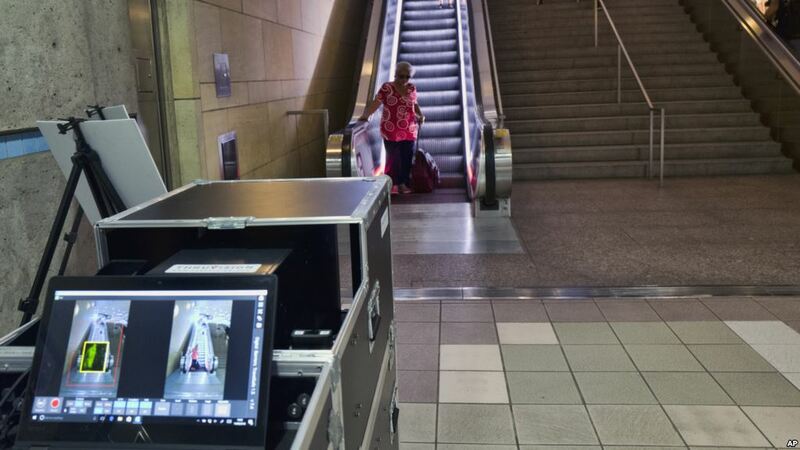 Passengers who rode down an escalator to ride the Metro Red Line at Union Station in Los Angeles on Tuesday were screened as Pekoske and other officials looked on. But after the news conference and media demonstration, officials packed up the equipment and carted it off. The TSA tested body scanners in New York's Penn Station in February and has also conducted tests at Union Station in Washington, D.C., and at a New Jersey Transit station during the 2014 Super Bowl. In December, a Bangladeshi immigrant injured himself by setting off a crude pipe bomb strapped to his chest in a subway passageway near Times Square in New York City. 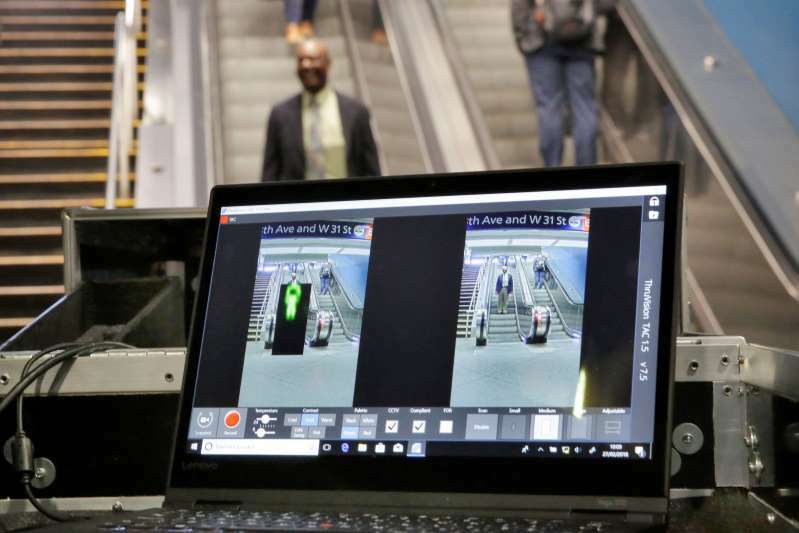 Metro has previously tested several different types of body scanners, including airport-style screening systems where passengers walk through a scanner. The pilot program was meant to evaluate the accuracy and capacity of the portable machines. About 150,000 passengers ride on Metro's Red Line daily and the subway system counted more than 112 million rides last year, officials said. They scan your body for objects that are blocking your naturally produced body waves. Both metallic and nonmetallic objects can be picked up by the scanner. "When an object is hidden in clothing or strapped to a person, these waves are blocked and detected by the system's software," reads a news release from LA Metro. "The software generates generic avatars and creates either a black spot on the area of the body where the item is concealed or overlays a color indicator." No radiation is emitted and the scanners will not display anatomical details. The technology has been tested this past year at the 7th Street/Metro Center Station. "TSA is pleased to have been a partner during the evaluation and testing process, which ultimately led to the purchase of a recommended system to help detect and deter potential acts of terrorism while keeping the traveling public safe," TSA Administrator David Pekoske said in the news release.